Having called Sydney home for 11 years I have met a few people in my time. I have even met a few people I would call ‘iconically’ Sydney….and this post series will be dedicated to them. Icons of Sydney…. A humble person that epitomises this life affirming, pulse racing, draw droppingly beautiful city. Danny Lim and his dog Smarty. The pair first caught my attention last year as I drove I along Cleveland Street, Surry Hills. There he stood at a major intersection, adorned with a sign that read – smile, be happy. It was a confronting sight… Heavy morning traffic, a glum winters day, commuters travelling at snail pace, frowning, distracted and dissatisfied with thoughts of yet another 9 hours at a computer desk. But smile I did when I saw Danny Lim, arms outstretched, smiling, beckoning us all with infectious enthusiasm to do the same. Fast forward a year, and I run into Mr Lim in North Sydney. I could not help myself- I stop to chat. I look around. He is right. No one is smiling. Danny and Smarty have the work cut out for them. But they are the right people for the job, if they can’t turn a frown upside down no one can. 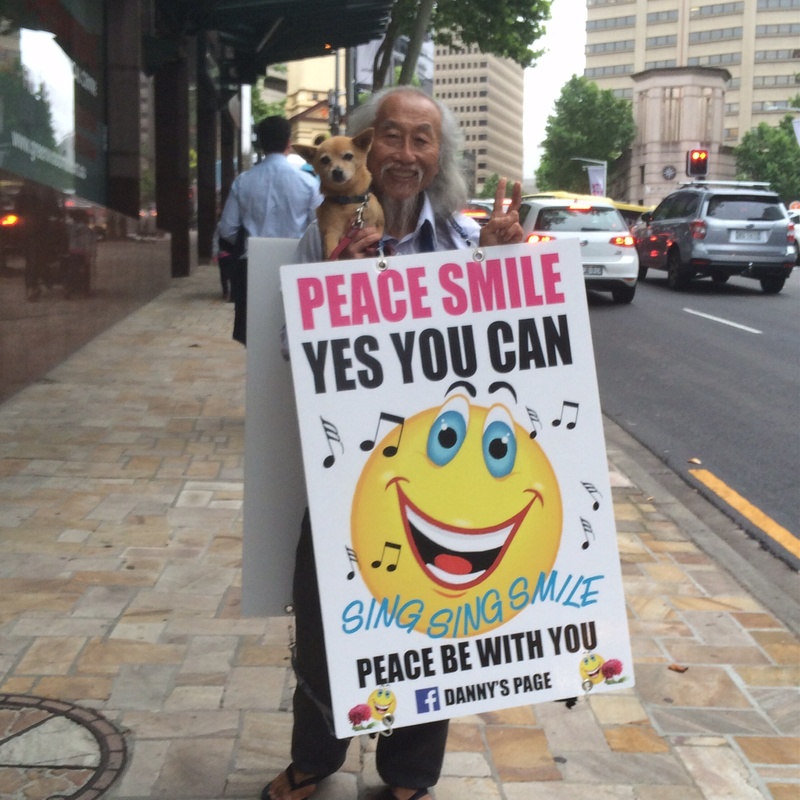 Danny Lim & Smarty the Dog- Icons of Sydney.